A favorite winter/early spring crop in our family is edible pod peas. Seeds can be planted in January and February, and ready to harvest in 50 – 65 days. Seeds require soil warmer than 45 degrees to sprout and will tolerate light frost. They prefer a sunny location. Freshly harvested peas, like garden grown tomatoes, only remotely resemble the less tasty versions available in the grocery stores – they are sweet and delicious. 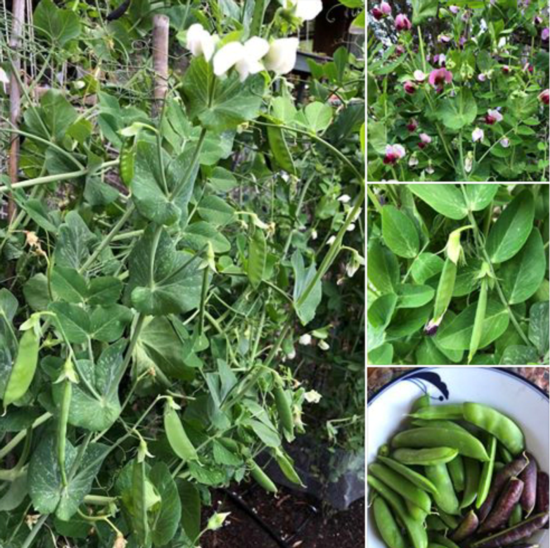 During the winter of 2017, two UC Marin Master Gardeners – one in Point Reyes and one in San Rafael – both grew edible pod peas as a study project for the Edibles Guild, sharing what they learned in a presentation to other master gardeners. Below, in a nutshell (or, more appropriately, a pea pod) are the key things they found out. Peas do best planted directly into the ground. Choose a day when the soil is not too wet to work (a few days after a recent rain) and prepare the area by adding some compost. There are different types of peas. Those commonly planted in gardens include English (or garden) peas, snow (or sugar) peas, and snap peas. English peas need to be removed from the shell before eating, but the pods on snow and snap peas are edible. Snap pea varieties that did well in both Marin garden locations include Sugar Snap, Super Sugar Snap and Cascadia. Sugar Magnolia, a purple snap pea with profuse tendrils, did well in San Rafael. Dwarf varieties like Sugar Bon and Sugar Sprint can be grown in pots. Plant the seeds one to two inches deep and two to three inches apart. If planting in rows, allow two feet between rows. Like other legumes, peas will benefit from the use of an inoculant before planting, which will add beneficial microbes to promote plant health and help fix the nitrogen. Most nurseries now sell small packets of inoculants. They can be applied to the seeds before planting (powder form), or sprinkled onto the soil at planting time (granular form). Young pea seedlings are attractive to snails, slugs and birds. The master gardener in San Rafael was dismayed to see her seedlings sprout, grow to 2 inches high, and then seeming disappear. It was only after using a motion detector “critter camera” that she discovered the birds were eating the plants. After reseeding and covering the rows with mesh row covers, the plants grew to be large enough to withstand any nibbling, and the covers could be removed. Pea plants require support structures for tendrils to grab onto as the plants grow taller. It’s best to put the supports in place soon after planting. Supports should be three feet tall for bush or dwarf varieties and six to eight feet tall for pole varieties. Seed packets indicate the average height plants will attain. Gardeners often use tomato cages or chicken wire as supports. Some create supports using string or nylon mesh hung over bamboo poles. As the peas grow, monitor them for support, occasionally using additional string to help maintain upright growth. About 45 days after plants emerge, you’ll begin to see the pea flowers, which can be in shades of pink, white and purple, depending on the variety you selected. In another week or two the peas will begin to form. Snap peas should be picked when they begin to fill out, but before peas are fully round. The vines are tender, so use a small scissors to clip the peas or hold the plant with one hand and gently pick with the other. Harvest often (every three days) to keep plants bearing. Most plants will produce peas for a month or more, as long as you keep harvesting and the weather remains cool. The leaf tips and tendrils may also be eaten, either raw in salads, or quickly stir-fried and seasoned with a bit of soy sauce.